Camille Valdes was born and raised in San Juan, Puerto Rico. Before law school, she received her undergraduate degree in Criminal Justice from Northeastern University and a Masters Degree in Management and Prevention of International Crisis from Universidad Carlos III de Madrid . She also worked as a Legal Assistant at Dechert LLP for three years. At MLaw, Camille works as a student attorney in the Unemployment Insurance Clinic. She has also been involved with the Philip Jessup International Law Moot Court Competition and the Latino Law School Association. 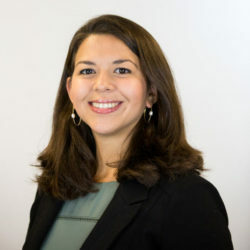 Camille spent her 1L summer as a judicial intern for Judge Jay García-Gregory in the U.S. District Court of Puerto Rico, and spent her 2L summer at the Department of Justice.